Running a successful creative venture often involves understanding business just as keenly as you learn your craft, and for artists and gallery owners facing the threat of a lawsuit, it’s important to understand the steps you can take to minimize the damage, including whether or not to pursue settlement. We previously discussed how understanding legal doctrines like warranty and due diligence can help artists avoid devastating lawsuits, instructing creative professionals how to take the proper precautions. Looking at the high-profile Knoedler Gallery case, in which the gallery was accused of selling fraudulent paintings to various collectors, we’ll continue the discussion by taking a look at the fraudulent concealment doctrine, another legal claim facing Knoedler in their multi-million dollar lawsuit, which also requires a healthy amount of due diligence to avoid any future legal claims. Additionally, we’ll discuss some useful strategies for determining whether or not a lawsuit is worth the trouble, no matter which side you’re on. Making international headlines is the widely discussed multi-million dollar lawsuit facing one of New York’s oldest galleries, Knoedler. Knoedler was sued by ten different collectors after it was revealed that a collection of paintings by Abstract Expressionist painters were forged. As it turns out, the paintings were created by a man in Queens, in collaboration with Gladifir Rosales, the unknown art dealer that sold the paintings to Knoedler’s director, Ann Freedman. According to Freedman, she had no idea that the paintings she sold were fakes, but the collectors weren’t buying: They sued Knoedler and Freedman in New York, alleging – among other claims – breach of warranty, RICO conspiracy, and fraudulent concealment. While the majority of the lawsuits originally filed against Knoedler have been settled, two are headed to trial – this, despite the fact that Knoedler has shuttered its doors, and may not be able to pay damages should a judgment be made against them. Gallerists and artists can learn plenty of valuable lessons from Knoedler’s mistakes. It’s not always easy to ascertain whether a work is authentic, but that doesn’t let you off the hook: There are steps that can be taken to show that you did everything in your power to verify the authenticity of an artwork, upholding your duty to your client while protecting your interests as well. 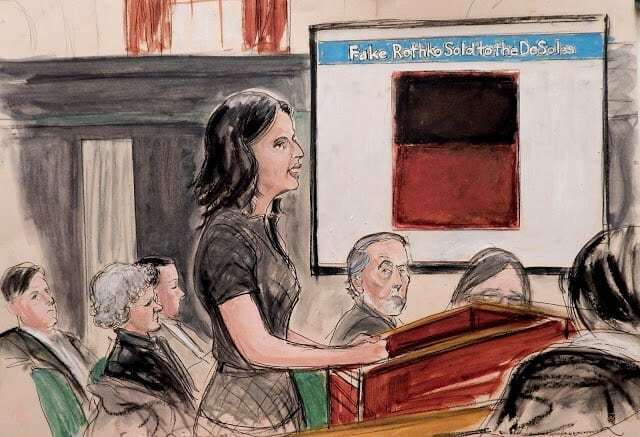 Knoedler’s lawsuit also serves as a cautionary – but no less instructive – tale of managing civil lawsuits either waged by you or against you, weighing the benefits between settlement and going to trial. where one party possesses superior knowledge, not readily available to the other, and knows that the other is acting on the basis of mistaken knowledge. Let’s apply those rules to a real life situation you may face. Let’s say you told a collector, who is a frequent purchaser of your artwork or your gallery’s artwork. That collector has come to rely on you in a fiduciary way, meaning that he considers you to have a legal relationship based on trust. Because he relies on your word as a fiduciary, your collector client will believe anything you say as the truth and will rely on your judgment when considering whether or not to make a purchase. Your relationship has created an express warranty between you. While this may seem like it’s put quite a bit of the burden on you as an artist or gallery owner, the law also assumes that you’ve done your due diligence in making statements to parties with which you have a fiduciary duty. In fact, so long as you’ve done your due diligence, and can prove you took every step necessary to warrant that what you were saying is true, the law lets you completely off the hook for any statements you may have made that later turn out to be false. Understanding due diligence in fiduciary relationships is vital for artists and gallery owners because authenticating artwork can be a risky business – unless you can prove that you took all the steps needed, a client could easily accuse you of fraud and prevail. But fraudulent concealment is more than just a failure to omit. As a party to a fiduciary relationship, you have a duty to disclose any and all information that could affect the other party’s decision as to whether or not work should be purchased. As we stated above, a duty to disclose includes a situation in which the offending party knew that the buyer had mistaken information, yet chose not to reveal it. These are pretty serious allegations, and, therefore, the burden of proving whether or not the offending party did have knowledge of false facts falls on the plaintiff. What does that mean for you as an artist or gallery owner? Proving fraud can be quite difficult for a collector – facts will need to be presented to show that the artist or gallerist took steps to conceal fraudulent information, which will be almost impossible to do if you’re doing your due diligence and documenting the steps you’re going through to ensure you’re providing factual information. In the case of the Knoedler gallery, this issue is tricky because Freedman didn’t do her due diligence, instead of taking at face value what an unknown collector deemed to be true. And even then, the plaintiff collector will have a difficult time proving that Freedman intentionally concealed certain information, because much of their allegations are speculative. To avoid any issues surrounding fraudulent concealment, gallery owners and artists should produce as many documents as possible concerning the authenticity, provenance, and validity of the work. In today’s litigation landscape, cases rarely get to trial for a number of reasons. Defendants, even when they think they have a chance of getting the lawsuit dismissed, often don’t want to take the chance of being wrong. And plaintiffs, when faced with the prohibitive costs of attorney and trial fees, would rather take a lump sum settlement. But understanding the risks of making one choice over the other is important for artists and gallery owners, no matter which side of the equation you stand. It’s important to understand that victory at trial doesn’t necessarily amount to getting what you want. Though a court can order damages against a defendant, the judgment is moot if the accused cannot pay. The Knoedler case is a great example: While most of the ten collectors who initially sued Knoedler chose to settle, the remaining two decided to proceed to trial. They probably felt the offered amount wasn’t high enough, but they also have the luxury of an endless budget to pursue the case to trial. On the other hand, it’s unlikely that any damages assessed against Knoedler will be get paid, considering Knoedler has shuttered its doors and would likely declare bankruptcy in the face of a debilitating judgment. Whether you’re faced with a lawsuit or deciding whether or not to pursue one, understanding how to weigh the risks of settlement versus trial can ensure you’ll save your creative business from a devastating judgment. Have you had any experiences like the one mentioned in this article? We would like to know. Just leave your comments below.